If Ursula Argyropoulos, had to describe the cakes of tomorrow using four adjectives, her words would be "whimsical, non-traditional, highly personalized and flavorful". Argyropoulos, owner of Art of the cake, grew up in Aachen, Germany, and learned her craft from her uncle who was a konditormeister. Argyropoulos, who trained for her craft at various cafes in Germany is famous for the realistic gum-paste creations she creates in her Back Bay workroom. 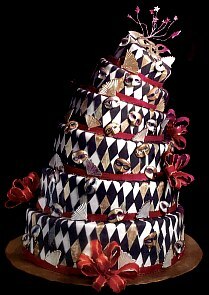 Argyropoulos does a brisk business with her Harlequin cake, which has inspired many imitations. "The Harlequin wedding cake was for a couple who wanted something unusual", she said. "They wanted their cake to make a statement, to be something different to reflect the mood." The six layer tilted cake featured brown and white diamond shapes and was adorned with Mardi Gras-style gold masks and burgundy bows. Argyropoulos' other funky creations also take the the cake. One was inspired by 19th century Viennese artist Gustav Klint's mural "The Stocklet Frieze", which featured an Asian woman in elegant garb. For this, Argyropoulos created a three-dimensional cake in the shape of a woman - a process that took about 16 hours. Another cake was an homage to MacKenzie-Childs, the whimsical New York-based china-design company. For this wedding cake, Argyropoulos crafted a pastry featuring tassels, stripes and squares inside circles. A "class menagerie" cake featured two-dimensional frogs, chicken, rabbits, ducks and herons. The confection was so unusual that at the last minute, the worried bride begged to have some traditional elements included. So Argyropoulos added one tier outftted with Swiss dots. "She thought she might have gone too over the top," Argyropoulos said. "Brides are looking to have fun. I see more and more brides willing to take risks to step out of the box," she said. A colourful Harlequin cake from Ursula Art of the Cake combines a huge helping of whimsy with a bit of future shock.